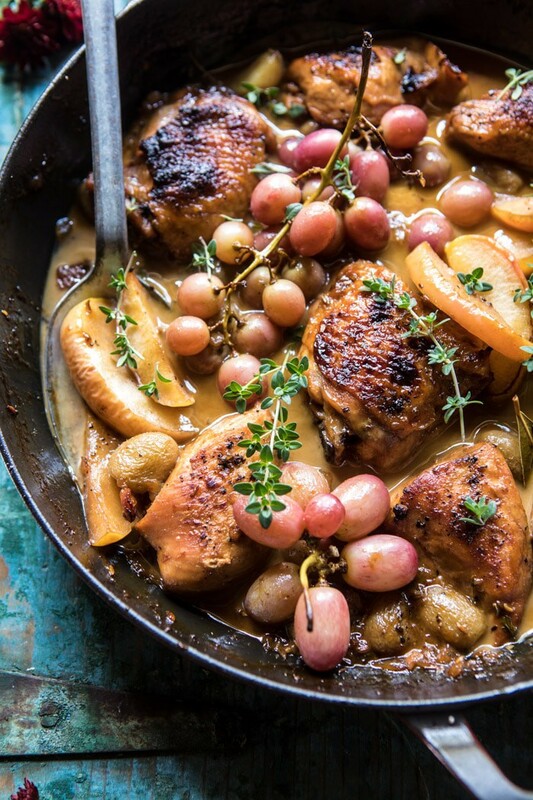 I know that it’s not technically autumn until Friday, but I’m kicking off the season a few days early with this autumn braised chicken escabèche with roasted apples and grapes. 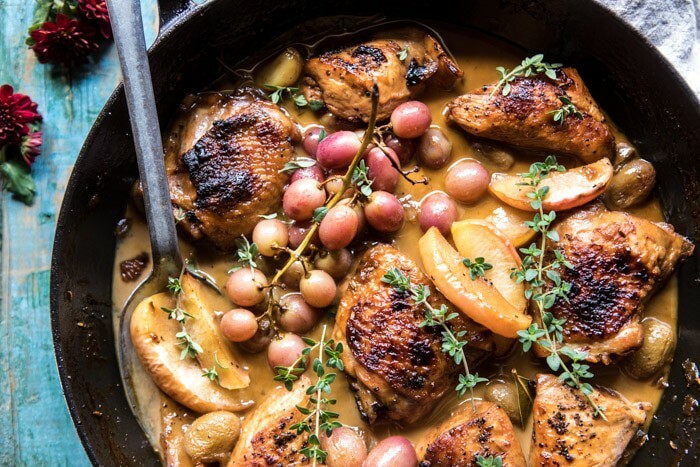 Better known in my mind as the most perfect, cozy, comforting, chicken dinner of fall. I’m hoping you’re not tiring of all my cozy eats because I have so many more planned. Sorry not sorry. OKAY. 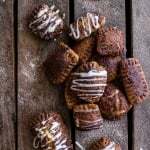 Before I dive into this recipe, a couple of things to share. We had a wildfire break out on Monday afternoon that was way too close for comfort. I’m talking a little more than a stones throw a way. We could see the entire thing, flames and all. Helicopters were dumping buckets of water that they kept flying over Lake Dillon to fill, and two giant tankers were spraying fire-retardant all over the flames to help tame it. There is no sugar-coating this fire, it was scary. We were predicted to have high winds yesterday afternoon so the fire fighters worked through the night on Monday and early morning Tuesday to keep it under control. Thank God for the amazing and brave fire fighters. I can’t imagine doing what they do. Big thank you to all you fire fighters out there, literally saving the day and so many lives. If you’d like to see some pics (and a super cool video) of all that we saw on Monday, check out this article in the Summit Daily (our local paper). Fingers crossed that the fire does not pick up again. Wildfires are no joke. On a much happier note, my parents got a new puppy (click here for a pic)! Or technically it’s Asher’s puppy, but Asher is just now nine, so we all know how that one goes. His name is still to be determined, but he is the cutest little Miniature Australian Shepherd. When my mom told me that she and Asher were driving three hours to pick up a new puppy on Sunday afternoon I said it was a bad idea. But after meeting this guy I was sold in a matter of .2 seconds. Puppies are possibly the best thing ever…I think need my own now. Ahh, maybe not. I’ve got to say, I am pretty happy I don’t have to take him out every couple of hours. But…so far so good, he follows Asher everywhere, and has even slept through the night…right next to Asher…no accidents yet either! So, if you guys have any good dog names up your sleeve, please leave them in the comments!! 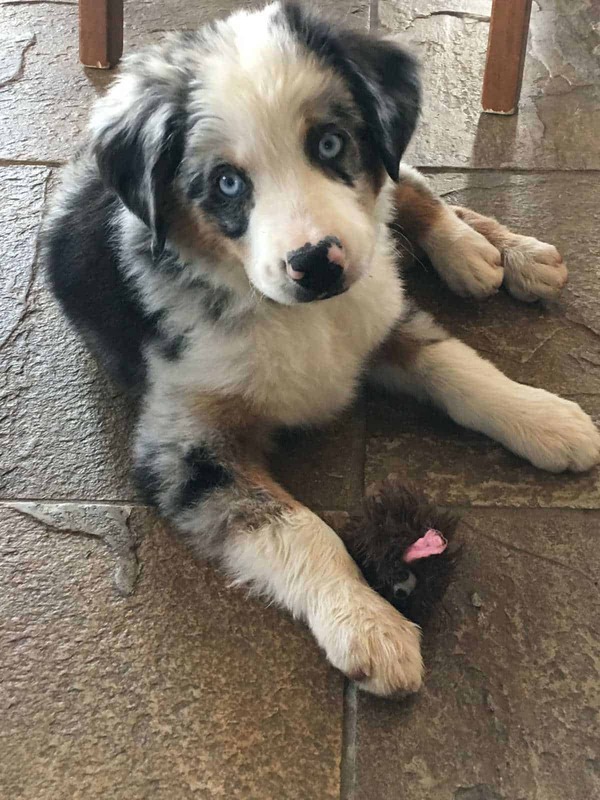 My family has been working on a name since Sunday (they like Blu or Merle…they started calling him that today) but no one has come up with anything we can all agree on. We need help! In the meantime, maybe I should tell you guys about my new chicken dinner that I am equally in love with? Ok, maybe not equally, the puppy probably wins. This is quite possibly the easiest, yet most delicious chicken I’ve made to date. And that’s saying a lot because I have made a ton of roasted chicken, but this braised chicken is just extra special. It’s sweet, tangy, and savory all at the same time. It’s also extra saucy and full of all my favorite fall flavors. The base of the recipe is made of three very important ingredients, white wine, apple cider, and apple cider vinegar. 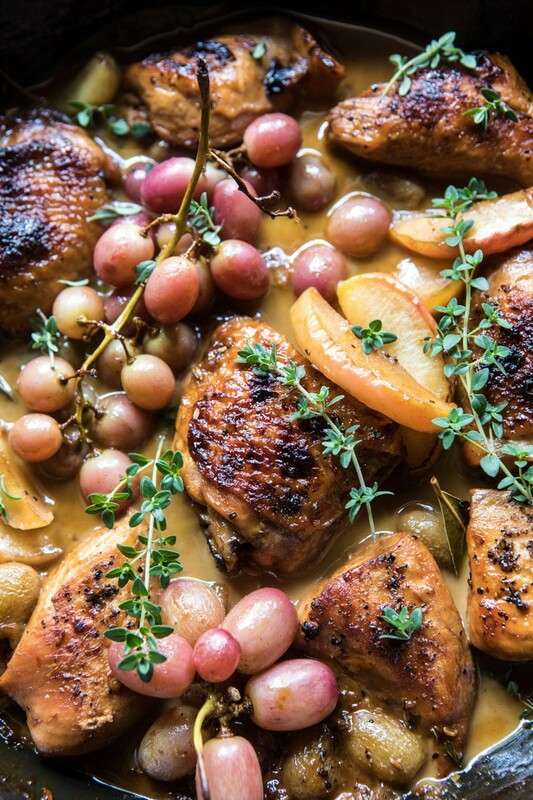 The combo of wine, apple cider, and vinegar is what make this chicken SO GOOD. It’s sweet and tangy and when paired with fruits like apples and grapes? Perfection on so many levels. The chicken melts in your mouth and when topped with the sweet and tangy sauce plus roasted apples and grapes?! Ahh, I really just cannot express how delicious it is, but trust me, this is no boring chicken dinner. 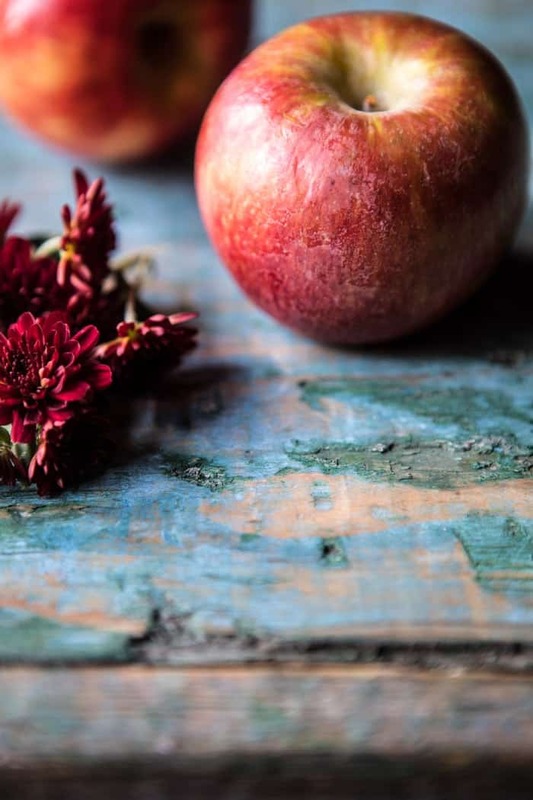 The Fall flavors truly shine here, and if you’re thinking that roasting apples and grapes is weird, think again. It’s all things deliciousness and you really need to try it. 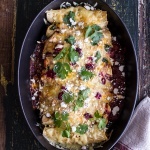 One of the best parts is how easy this dish is to make. It’s a one pan, ready in under an hour kind of meal. Um, yes please! This is totally do-able for any weeknight, but also fancy enough to serve for your next autumn dinner party. I recommend these potatoes, this bread, and a side salad. YUM. 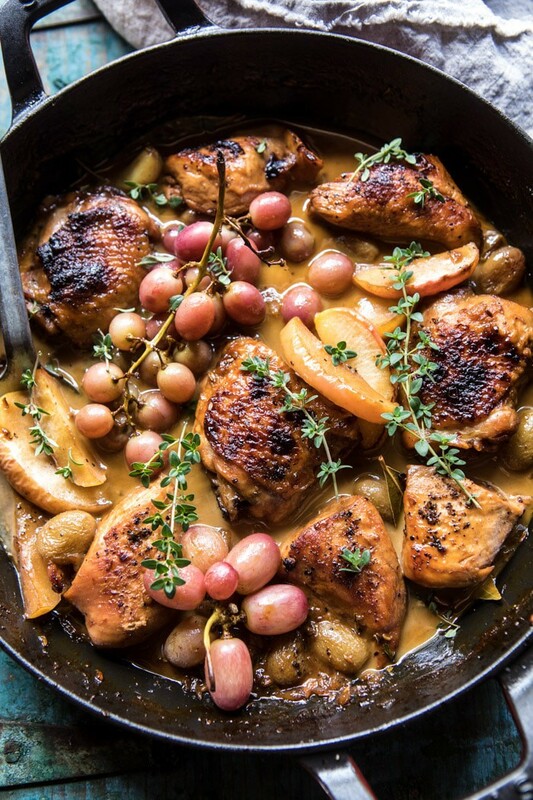 I know that it is not technically autumn until Friday, but I'm kicking off the season a few days early with this autumn braised chicken escabèche with roasted apples and grapes. 2. Heat the olive oil in a large dutch oven or cast iron skillet set over medium high heat. Season the chicken with salt and pepper. When the oil shimmers, add the chicken and sear on both sides until golden, about 3-5 minutes per side. Remove the chicken from the skillet. 3. To the same skillet, add the onion, garlic, and cumin seeds. Cook, stirring occasionally until the onion is fragrant and the cumin seeds toasted, about 8-10 minutes. Slowly pour in the wine, cider, and apple cider vinegar. Bring to a boil over high heat and then reduce to low. Slide the chicken back into the skillet, skin side up, it should be mostly submerged. Add the chile, bay leaves, and thyme. Sprinkle the apples around the chicken and season with salt and pepper. Transfer to the oven and roast for 15 minutes. Remove from the oven, add the grapes and return to the oven for another 10-15 minutes or until the chicken is cooked through. 4. 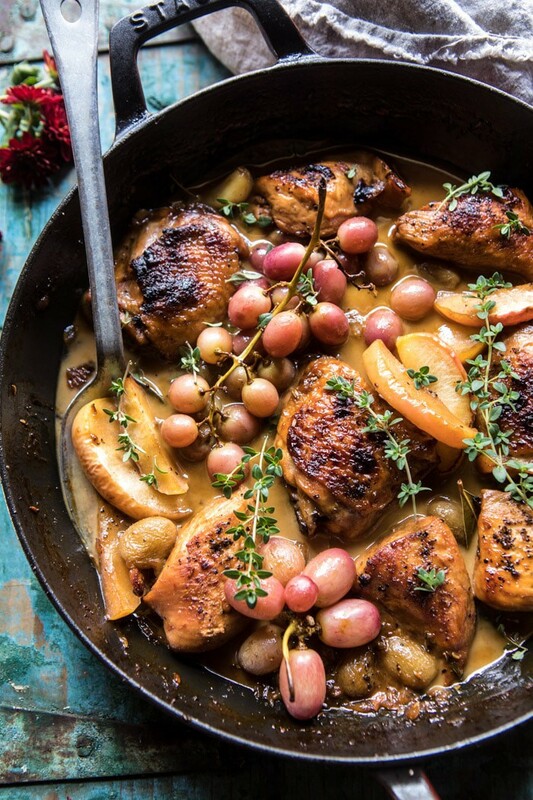 Let the chicken rest 5 minutes and serve with the sauce drizzled over the chicken with the roasted apples and grapes. Enjoy! 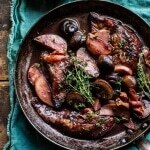 Sunday night dinner planned, you are so welcome. ps. HBH retreat kicks off tomorrow and while I am so excited I am also nervous…just praying I don’t make a giant mistake with Saturday night’s dinner…yikes, yikes, and yikes. Stay safe with the fires and have fun with the retreat! How about “Levi” for Asher’s new puppy? Awh such a cute name! Thanks Andrea! I love love love puppies. I also love the look of this dish, am rally getting hungry now! That salad sounds awesome to pair with this Amanda! Oh and Dax is such a cute name! Totally taking that one into consideration! Thank you! This looks amazing!! Can’t wait to try it!! I’m from Cleveland but my family has a house in Dillon and the fire is literally across the street! SOOO scary and so thankful for the firefighters keeping everyone safe. Made two recipes out of your book yesterday! (the apple pie and potato chip chicken) Both were delicious! Congrats on the cookbook! Its beautiful! Oh no! I hope your house and family are safe! I am thrilled you are loving the book and those two recipes!! Thank you Maureen! This looks delicious! Do you have some ideas for making this vegetarian? If so, please let me know what you’d suggest and at what step I should add it to the recipe. Thank you! Thanks David! Thats a little hard since the chicken is the main ingredient. I think 2-3 cans (drain them) of chickpeas would work well though. I would add then when I say to slide the chicken back in. Let me know if you have questions. Awh all so adorable! Thank you! Came for the recipe…stayed for the puppy. 🙂 And I love Miles for a puppy name! Miles is such a good one! Thanks Ashley! Thank you so much Carol! He is so sweet! The puppy is adorable. I think that SHEP would be a great name. So cute! I hope you love this recipe! Thank you Patricia! I pre-ordered your book in May and it finally arrived in HK and got onto my hand yesterday! Today is my 18th birthday ( it’s Sep 21 morning already in HK) and your book is the best birthday present! I just made this for dinner and my husband said it tasted like fall! So yummy! Awh thats awesome! I am so glad you both liked this Katie! This was so appealing in my in box this morning! Chicken in the freezer, grapes in the fridg, apples on the tree, jalapeños in the garden.. didn’t want to go to the store so I thought about substitutions. I used Trader Joe’s orange muscat chamagne vinegar and an Izze Peach juice for the apple cider. It was delicious! It shows that the recipe is quite versatile. Yay! So creative! I am so glad you found good substitutions and am so glad you enjoyed the recipes!! Thank you Sydney! Hey Kristin! Thank you so much for all the suggestions! Love them all! This dish looks great!, Glad you were safe from the fires! How about Senor Escabeche for your new puppies name? Am I too late for the naming? We have puppy ideas! Chip (short for Chocolate Chip), Stu (short for stew), Cassie (short for Casserole), Quinn/Queen (short for Quinoa) and finally, simply, Cookie! What a sweetie! Those are so creative! Thank you Lori! 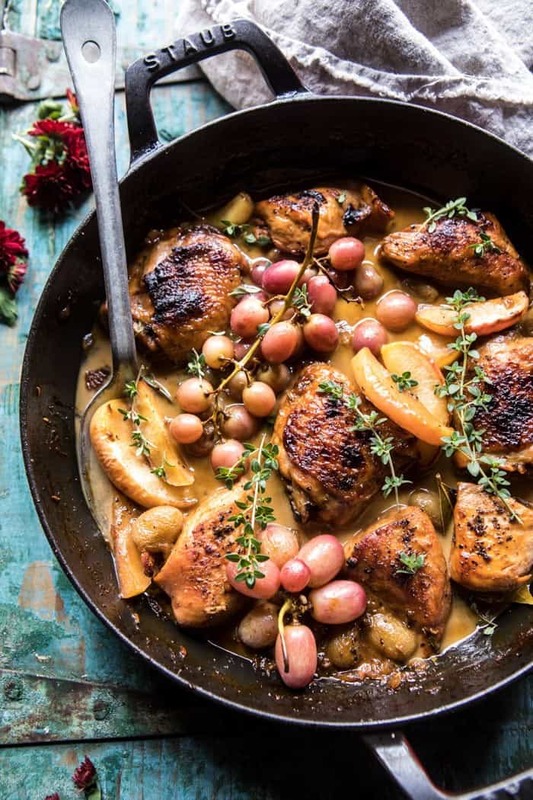 This is such a pretty autumn meal, perfect for fall dinner parties! For the Pup, how about Stew? Lobe the recipe and picture of the pup! So cute! I love that it goes along with cooking 😊 Thank you Kim! Yum! And Huckleberry Hound Dog. This looks delicious! Could you give me a substitute for white wine? I don’t drink or cook with wine. What would you suggest as a non alcoholic substitute for white wine? Hi Amanda! Use an equal amount of chicken broth. Let me know if you have other questions. Hope you love the recipe! Thank you! I always wish there were more comments on the blog itself from people who’ve made the recipe, so I am just chiming in to say I made it! It was easy to make and very tasty. I had it with crusty bread and a side of carrot soup. Come to think of it, carrots would probably be a nice addition to the dish itself. I found that, when I went to slide my chicken in to bake, there wasn’t quite enough liquid to cover them entirely. I added a few extra glugs of white wine right before putting it in the oven and it worked out well. SO glad this turned out great for you! Thank you Jana! Hi! I’ve noticed a couple times in your recipe the recipe says “cumin seeds,” but the link is to ground cumin. Which do you use? Thanks! Hi! I’ve noticed a couple times in your recipes the recipe says “cumin seeds,” but the link is to ground cumin. Which do you use? Thanks! 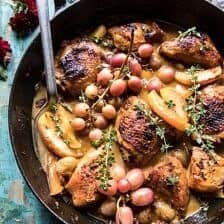 I tried making this recipe and while I loved the flavors it came out with chicken and a braising liquid and not a sauce like in your pictures. What is the trick to end with a thicker sauce instead of just a lot of liquid? I love your book and blog so much! 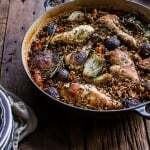 I am making the Cranberry Pork Chops this week and I’d like to make this chicken next week (two kids and tons of sports means I have to plan ahead) – are the cumin seeds absolutely essential? Would ground cumin be too strong as a substitute? What would be a good side dish with this? I’m more along the lines of mashed potatoes or polenta to soak up the sauce vs rice or pasta, but since I haven’t made it yet that’s just a guess. What would you recommend? Far out! You have such a mastery of taste dynamics. At face value, this seems strange. But when you cook it.. it couldn’t be more perfect. Beautiful depth of flavours. Paired with oregano potatoes. This is the best!! I can’t count how many times I’ve made it. Everyone always loves it! Made this when it first came out and it was amazing! Making it again tonight with the potato and bread recommendations. So looking forward to it!! Will post a pic on Insta! I cannot wait to see it! I am so glad you loved this Christin! Thank you!